A coastal city in incorporated in British Columbia, Richmond is located on the Lulu Island. It is home to a lot of scenic beauty and at the same time, it is also home to a lot of residential and commercial properties. People in Richmond love the weather and nature and they are well settled in their homes. Richmond is home to some amazing and brilliant commercial properties as well. We don’t limit ourselves to a particular type of door repair. As a company, we provide fixes for wood and metal doors whether they are residential or commercial. Moreover, we as a company believe in the fact that every door, irrespective of where it might belong, might need to get a temporary or permanent fix and that is why we are willing to provide a solution for all kinds of glass or steel door. Therefore, whether it is a commercial property that needs a door repair or fix or a residential property that needs a fix, we can provide pretty much any and every solution. As a company, 24hr Door Repair provides home door frame repairs (for paint jobs or complete frame replacement), including door frames of automatic entry doors. We provide fast door replacement services to our customers. We are a company that believes in providing round the clock services because there are times when someone might need a fix instantly for an instant and immediate purpose. This is where we come in. We are available 24/7 and we work to ensure that we provide instant fixes. We believe in providing emergency services and we are just a call away in providing instant fixes for our customers. Therefore, in any case, that you might need a lending hand for your new door installation and don’t know where else to look, we might be just a call away. Irrespective of the day and time it might be, we can help and help right away. Aside from providing residential and commercial door fixes, we are a company that provides other door repair services as well including lock changes and sliding door repairs. We are extra careful about your sliding glass doors and have a remedy for every problem. 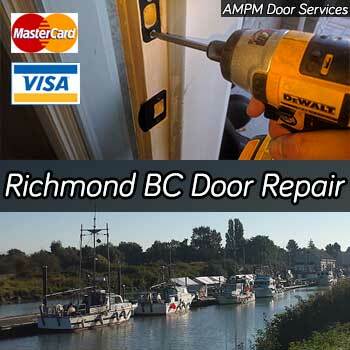 Therefore, if you are looking for a reliable door company in Richmond BC, you need not look any further as we have a perfect solution for fixing all types of doors instantly.